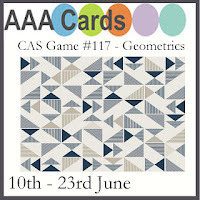 Today I have a card for the AAA Cards Geometrics Challenge. I used some MFT triangles to create the geometric panel and the many thanks die is Essentials by Ellen. I cut it from patterned paper as well as black cardstock and layered it up. Finally I coated it generously with Glossy Accents for a some shine. Love how this simple line of triangles makes such an eye catching Card. Loving be it ! Thanks for playing at AAA Cards. Great design, Jen! I might have to CASE this for some masculine birthday cards I need to make! Fabulous! I love geometric cards and this one is a beauty! Ooh! 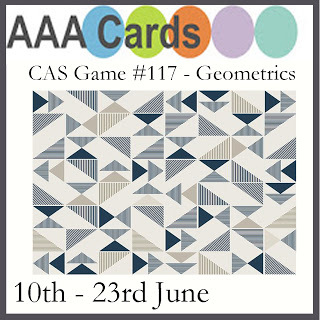 I love how you've used the triangles - great design and fabulous colour combo too! Thanks for playing along with us at AAA Cards! Love the colors you chose for the triangle, Jen, and the patterned die cut goes perfectly with them.